I looked for some growing tips, and found out the plant will be hibernating over the winter. Amazing. So far, it has trapped one fruit fly and a big one. (I don't know how the big fly came in to my place - I always keep my screen shut. Did the plant attract it?) 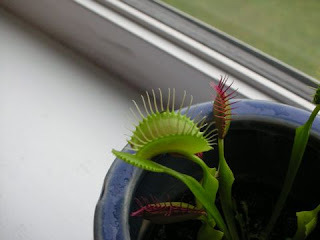 It is very weird feeling to see a carnivore plant working in front of me. I don't dare touch it with my bare hand. that's so cool. I've never seen these at Safeway. Can it survive without eating flies? 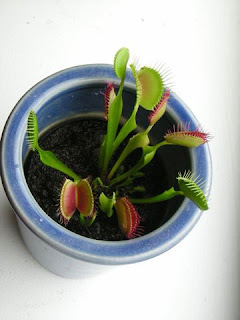 I think I had one as a kid--I may have fed it raw chicken or something....anyway, like most of my plants, it died.